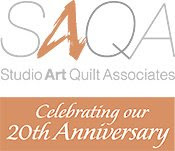 My Calendar Girls quilt group chooses a different theme each year for our calendar. The challenge for our next year is "Flowers". I started looking through my old photos & found some inspiration in my Barcelona trip album. In Barcelona, we walked down the Las Rambles several times. 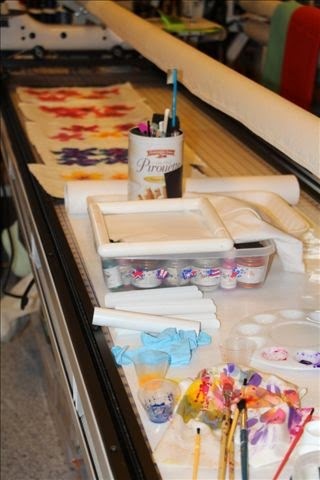 There were painters, & artists, & flower stalls. It was like an outdoor market every day. I also loved the textures of the stones & old buildings. 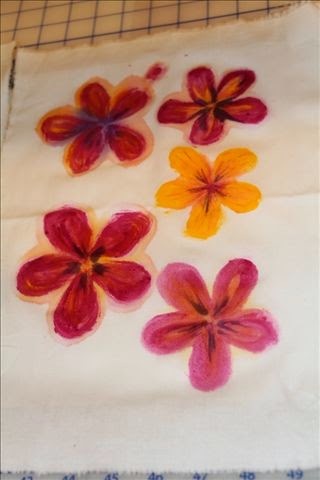 I decided to do flowers on fabric, by painting them with my Dynaflow paints. 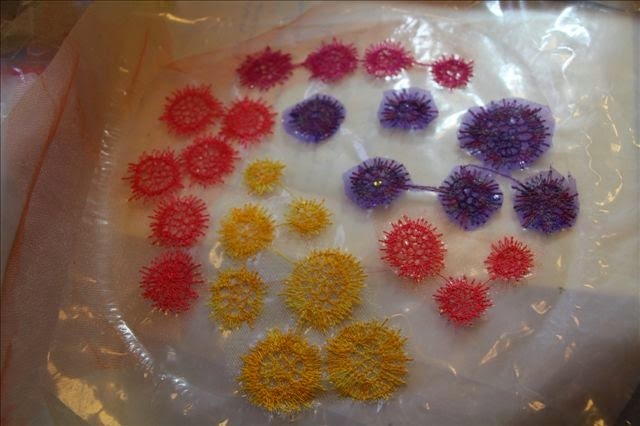 I also did little fantasy thread flowers on Solvy (wash-away stabilizer). 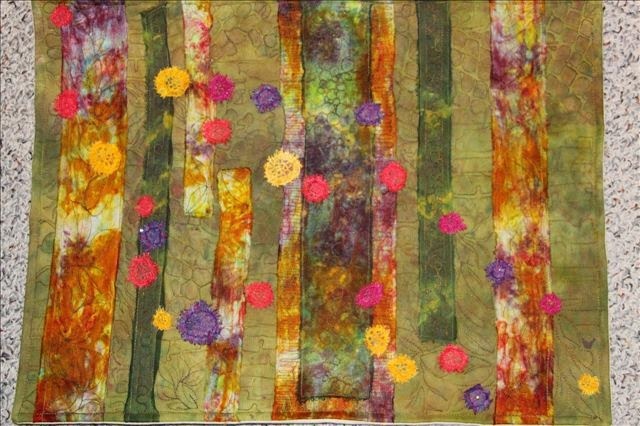 I made a back ground quilt, using my own hand-dyed & hand painted fabrics. 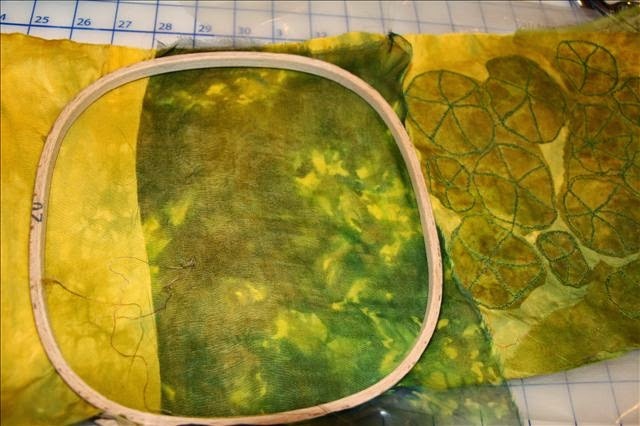 I layered sheer silk (which I painted), & silk strips that I dyed. 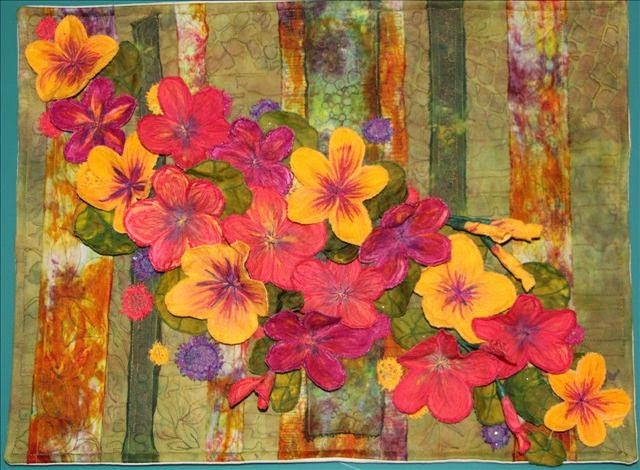 I scattered the thread flowers across the surface & quilted. thread painted then cut out & washed them. 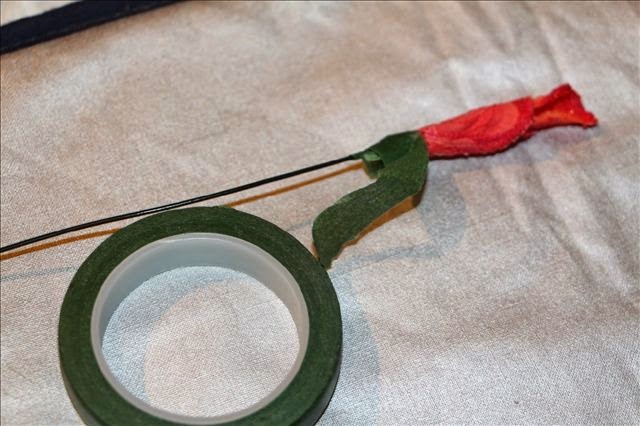 I dissolved the stabilizer enough to make it invisible, but left enough in the fabric to make it dry stiff. 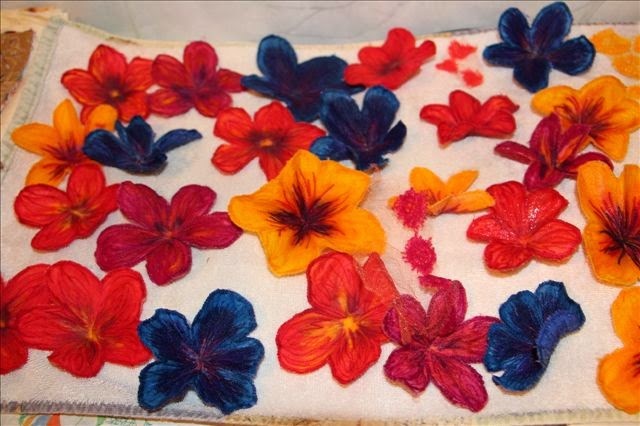 I shaped the flowers while still wet, then let them dry, so they have dimension. I also made leaves, the same way. 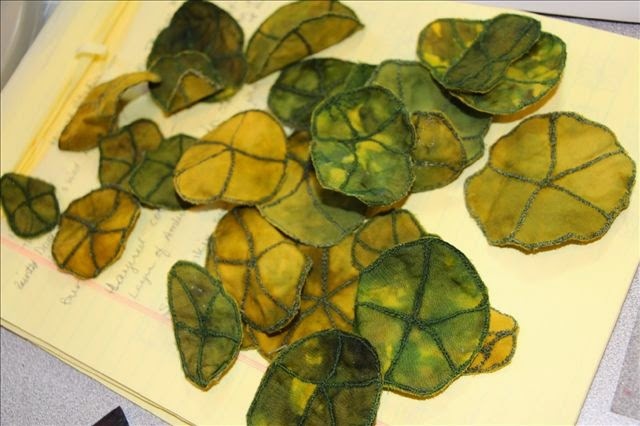 I decided I didn't want to use the blue flowers, & the others, made me think of Nasturtiums, so I made leaves like Nasturtium leaves. I also used wire, beads, & floral tape to make some buds. 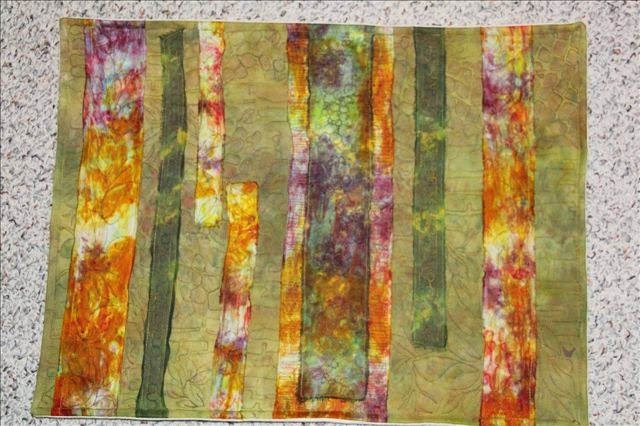 Here is the almost finished quilt. I will be beading the centers with glass beads, that I intend to make myself. I've taken a Lamp-working class in the past (several years ago), & I have everything I need to get started, but feel like I need a refresher, so Ive signed up for a class in 2 weeks. 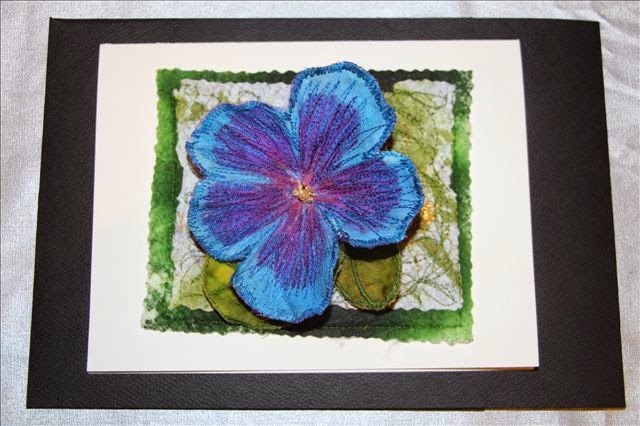 Here is one of the leftover blue flowers, made into a pin/card for a friend's birthday. 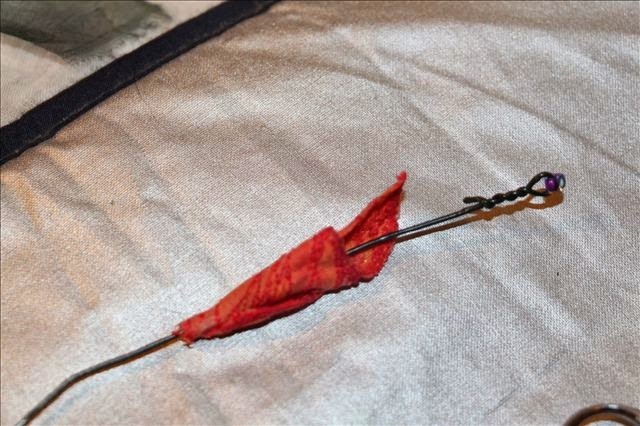 I used a few seed beads in the center, & sewed a pin to the back. Thanks for sharing. Love all the dimensions! Exquisite, as always, Deb! Can't wait to see it in person! I'm glad yo shared this because I was wondering! I am so glad to see the most creative person I know back! 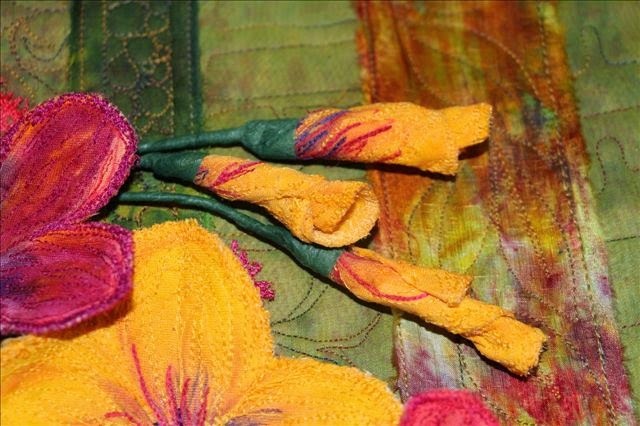 I am always amazed by your work, love the flowers and your hand-dyed background. Wish I was taking the lamp work class with you. Very artistic! I like the dimension! Wow I LOVE this, it is amazingly beautiful, like all your other creations.